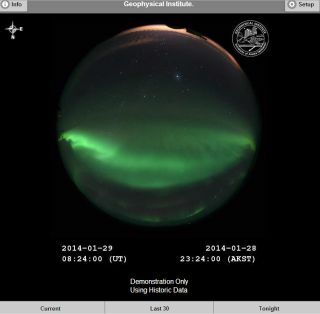 A screenshot of the northern lights app developed by Don Hampton of the University of Alaska Fairbanks to share the wonder of Earth's auroras with the public. ATLANTA - The Fairbanks North Star Borough, the area around Fairbanks, Alaska, has about 85,000 people in it. But the area more than doubles its population when all of the tourists who come to see the spectacle of the northern lights are factored in, says Don Hampton, an assistant professor at the University of Alaska Fairbanks. But not everyone can make the trip out to a relatively remote place like Fairbanks, or wants to endure winter's below-freezing temperatures to catch the sky show. So to bring the auroras to the rest of the world, and to get people interested in space weather, Hampton has helped maintain a set of cameras at the Poker Flat Research Range (originally a sounding rocket research site) focused on providing real-time images of the ebb and flow of the aurora borealis. Hampton said he started showing the round-the-clock views of the auroras as "a way to get people interested" in the broader topic of space weather, which can have an impact beyond setting off pretty sky displays, potentially impacting satellites, the electrical grid and other critical infrastructure. Auroras are created when charged particles from the sun interact with Earth's magnetic field and are funneled toward the planet's poles. The particles strike molecules in the atmosphere, which give off light in particular wavelengths — the auroras. But when the sun sets off a solar flare or a storm called a coronal mass ejection aimed at Earth, those charged particles can mess up important systems. Hampton's cameras show a set of images: two of the auroras with north at the bottom of the image (to mimic how the sky would look if one was looking toward north outside) — one of those amped up so researchers can see emissions that would be harder to detect with the naked eye, and one that shows what the aurora would look like if you were standing outside looking at the sky. There's also an image with the aurora mapped to the Alaska landscape, as well as time-lapse movie of the last 30 minutes and the night so far. The app won't be available until around March, Hampton told Space.com here at the annual meeting of the American Meteorological Society where he presented the idea this week, but a demo can be viewed at the following website until the end of the month: http://allsky.gi.alaska.edu/demo. Follow Andrea Thompson @AndreaTOAP, Pinterest and Google+. Follow us @Spacedotcom, Facebook and Google+. Original article on Space.com.